Fiona Phillips, Alzheimer’s Society and People’s Postcode Lottery Ambassador. Both my parents had dementia so I know first-hand how isolating it can be. This is why I feel so passionately about Alzheimer’s Society’s new service ‘Side by Side’ which helps people with dementia stay connected to their communities and keep doing the things they love. 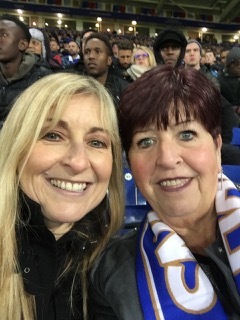 Last month, I learnt more about this life enriching service when I joined Irene, a fellow football fan, during a much anticipated match between my team, the mighty Chelsea, and her team, Leicester City. Irene has dementia. But that didn’t stop us coming together to share in something that we both enjoy. Irene has been paired with Winnie, a Side by Side volunteer and told me how much the service means to her. Thanks to a generous grant of £1.3 million from the People’s Postcode Lottery we are expanding the service. Side by Side now urgently needs volunteers from your area to pair with people with dementia and who are eagerly waiting to meet someone to share in their interests; this could be going along to the football, taking a stroll in the park or joining a local club together. I would urge anyone interested in making a difference by becoming a Side by Side volunteer in Wales to get in touch, visit alzheimers.org.uk/sidebyside or call 0300 333 0804 to find out more about this wonderful service.